One of the greatest scientific achievements of the last decades is the discovery that stem cells can be separated, stored, and cultured under laboratory conditions, and most of all, they can be used for healing processes. Stem cells are exceptional cells that can transdifferentiate into different cell types depending on the condition of their environment. The most promising area of medical sciences is cell therapy the most obvious and widely-known form of which is bone marrow transplantation. The essence in brief is the following: the necrotic tissues are repaired or reconstructed partly with the contribution of stem cells if the necrosis has not led to death. In these cases the number of newly developed, circulating stem cells is significantly and demonstrably increasing in the blood flow. The most perfect, widely-applicable stem cells appear during the first proliferation after insemination. If cells are separated in the morula stage, identical twins can be born. According to our current scientific knowledge, embryonic stem cells harvested from the umbilical cord are able to transdifferentiate to a lesser but still significant extent. The transdifferentiation ability of adult stem cells is even lower but they are still suitable for certain therapeutic purposes. Nowadays, it is possible to produce cell suspension from adult stem cells, in which stem cells are in majority. 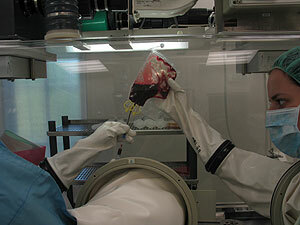 Consequently, a large number of stem cells can be administered to the problematic region. 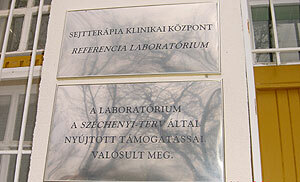 In Hungary most patients are treated with their own (autologous) stem cells. It means that the cells to be applied for the therapy are collected from the patient who will receive them. In special cases stem cells deriving from a person other than the patient may be required, meaning that stem cells usually collected from family members are used for the therapy (allogeneic transplantation). In certain countries embryonic stem cells are also used for therapeutic purposes. The daily operation of the Cell Therapy Laboratory is based on the joint activities with the clinical departments, the laboratory producing tailor-made autologous cell therapeutic products with the help of state-of-the-art equipment, as well as the independent quality control laboratory. Current research and innovative scientific work is supervised and supported by a board involving internationally renowned scientists. A major criterion with regard to the therapeutic products is that production and application have to be in line with the most stringent professional rules: GMP (Good Manufacturing Practice) and FACT-JACIE have to be fully observed concerning production, whereas GCP (Good Clinical Practice) has to be followed with regard to patients' care and clinical examinations under the supervision of the Medical Research Council (ETT), the National Institute of Pharmacy (OGYÉI-OGYI), and the National Public Health and Medical Office Service (ÁNTSZ). The Cell Therapy Laboratory has successfully started the application of tailor-made immune therapies, and the introduction of protocols defining new treatments in several indication areas.